In this episode we talk about what is the purpose of assessment in education, what types of assessment are out there, and do assessments accomplish their 'purpose', whatever that might mean. Assessment is a lot more than a standardized test. Chez Assessment is one of the most popular restaurants in the K12 neighborhood. Although it claims to be a family-friendly restaurant, how much of the menu do you understand? There’s not even a kid’s menu. With all of the complaints, how does the place stay open? Just like fast-food joints, most people think schools eat there too much and it’s not good for you (if you believe the research, up to a third of a school’s time is spent there). Just like a hipster, gastropub joint, most people cannot understand the menu. Just like The Cheesecake Factory, the menu is so long, how is a school supposed to know what to order. Just like the seedy-looking greasy spoon down the road, most people want to avoid it because they heard others have gotten sick eating there. Some parents think it is so bad they keep their kids at home when they hear another trip to Chez Assessment is coming. Toeing the line of stretching a metaphor too thin, assessment does have a lot in common with The Cheesecake Factory. All of the items on the restaurant menu were put there to meet a particular need or desire. But there are lots of different tastes and the Factory tries to meet them all. Quality food is difficult to make, yet a franchise restaurant such as The Cheesecake Factory has to scale their methods to hundreds of restaurants. If you want customers, the prices need to be affordable. 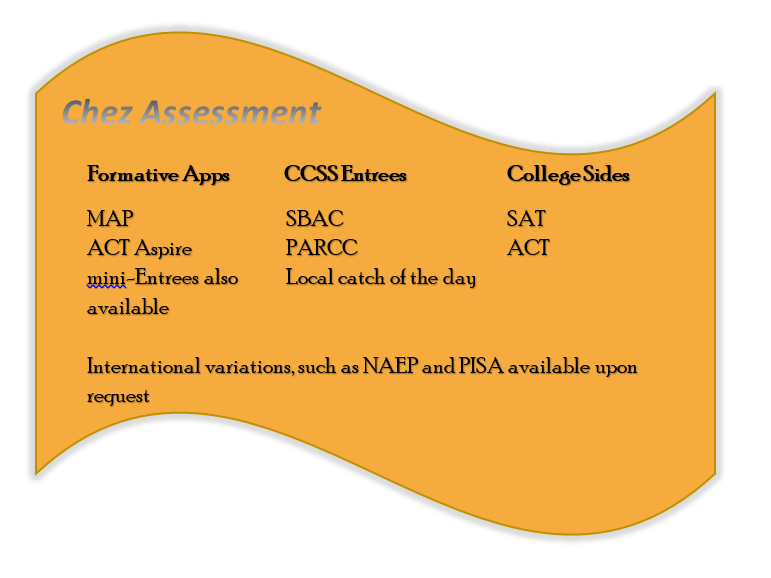 Just like the menu at Cheesecake Factory, the assessment industry struggles because there are too many goals being met, too large a desire to answer complex learning questions with a simple answer, and good assessment costs money most schools, districts, and states do not have. Schools want to use assessments for a myriad of questions. While these are all important questions, standardized assessments are better at some of these than others. What have students learned? Where might they be behind in their learning? Will a student succeed in college? Which schools provide a better education? Are students prepared for the next unit in the course, the next course, grade level, college? These are all challenging, yet important questions. Yet many of us who care deeply about the questions do not have the time or expertise to understand the complex answers to these complex problems. The local realtor wants to be able to say “The schools here are the best in the region.” Administrators want to say “Our teachers improve student learning.” Parents want to know their children are learning what they need for success in college and career. These answers would be best in book form, not as a number from 1-100 or a grade from A-F.
Answering these questions in a valid and reliable way is not cheap. “Bubble” tests would be replaced with collections of student work, open-ended tasks with multiple correct “answers”, and computer-adaptive testing. The entire menu of Chez Assessment wants to move in this direction but do districts and states (mostly states) want authentic assessment enough to pay substantially more for it. I assert most people would say The Cheesecake Factory is a good, but not great restaurant. Some cheesecake lovers probably believe it’s the best place ever. Others probably find it to be generic and overwhelming with a plethora of better ideas for a restaurant. So it is with assessment. The current menu is the best attempt to answer good questions with answers in the format the community wants and at a price tag the community is willing to pay.